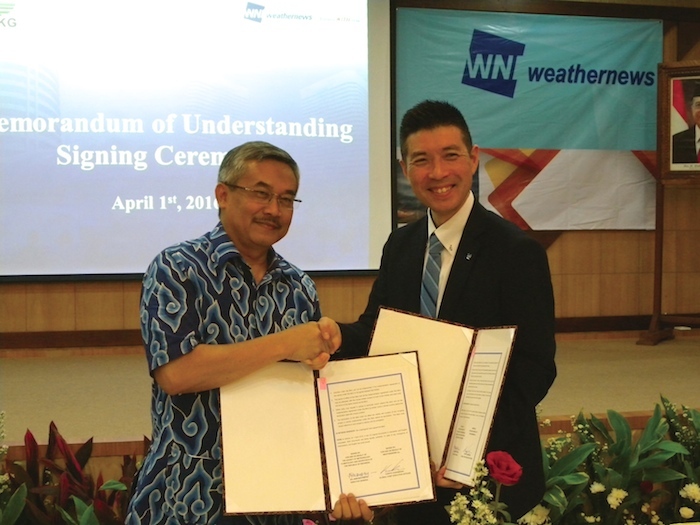 Weathernews Inc. and Indonesia’s BMKG Sign MoU for Reducing Victims and Damage from Natural Disasters – Weathernews Inc.
Weathernews Inc. (Chiba, Japan; Chihito Kusabiraki/CEO) has announced the signing of a Memorandum of Understanding (MoU) with the BMKG (Badan Meteorologi, Klimatogi, dan Geofiskika; Director Dr. Andi Eka Sakya) of Indonesia on April 1st. This MoU is the beginning of collaborations between Weathernews and the BMKG to mitigate victimization and damage from natural disasters in Indonesia. Weathernews has been providing weather risk services to global businesses and the general public of Japan since 1986, and last year opened an office in Jakarta. Flooding, earthquakes and tsunami affect Indonesia much as they do Japan, so the goal of this MoU is to build a wide observation network across Indonesia using Weathernews’ proprietary sensor devices like WITH Radar and TSUNAMI Radar. Weathernews and the BMKG will also exchange technology and know-how for more accurate and detailed global forecasts. By providing risk communication services, Weathernews aims to contribute to the continued growth of the country as well as the safety of people living in Indonesia. Weather detection network in Indonesia by including Weathernews’ WITH Radar for advanced storm detection and TSUNAMI Radar that can detect tsunamis up to 30km offshore. Exchanging practical knowledge of meteorology, climatology and geophysics and observation data. Advanced forecasting training for BMKG staff from Weathernews. Weather advisory and risk communication for Indonesian businesses operations. BMKG Director Dr. Andi Eka Sakya (left) and Weathernews CEO Chihito Kusabiraki (right) holding the signed MoU. As the world’s largest private weather company, Weathernews has been engaging in efforts to contribute to public safety and business development in neighboring Asian countries while expanding its global forecasting infrastructure.